Most will agree 2016 will not go down in history as the best year humanity has ever known. In the next few days, major news outlets will flood the internet with traditional end of the year wrap-up lists. Sadly, these will contain many horrendous stories, in part because these stories are relevant, even more so because these stories attract the bulk of readers. Allow me to remind you about five amazing things that have taken place in this annus horribilis. 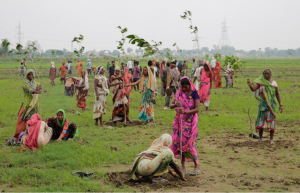 Over 800.000 Indians joined forces in July to plant 50 million trees in 24 hours. Doing so, they have set a new world record. It greatly trumps the previous 850.000 trees record of neighboring country, and traditional competitor, Pakistan. The people of India did this to show their commitment to the Paris Climate Agreement. This is what I call a hands-on approach. A new study by professors Tavneet Sury (MIT Sloan Business School) and Billy Jack (Georgetown University) claims that, over a 10-year period, the mobile payment system M-PESA has lifted 200.000 Kenyan households out of poverty. Moreover, the bulk of these positive effects stems from the empowerment of women in the region. The professors estimate that 185.000 women have traded in subsistent farming jobs for business and retail opportunities. Columbia has been struggling with a terrible civil war for over five decades, which resulted in over 200.000 casualties. On the 24th of November, Colombian president Juan Manuel Santos was able to sign a revised deal with the FARC, imposing a historic ceasefire. For his efforts, Santos was awarded the Nobel Peace Prize of 2016. Tijn, a 6-year-old that suffers from a rare brainstem cancer, wanted to raise €100 for a Dutch charity campaign called Serious Request. 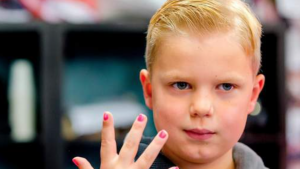 Tijn is second to none when it comes to applying nail polish, so this is what he did. For at least one euro, he would polish your nails and brighten your day. The young boy has taken the Netherlands by storm and managed to collect over 2,5 million euro, a new record for Serious Request. Hero. He deserved it and we all know it. Nobel Prize Winner Daniel Kahneman addressed the cognitive biases present in everyone of us. In order to survive, human beings need to be aware of all potential threats and react quickly to them. Because of this, we have the tendency to give more weight to negative rather than to positive news. Need proof? Just read which news stories were voted in the top 10 of Associated Press this year. Karl Popper coined the phrase ‘Optimism is a moral duty’ and I strongly believe this to be true. Even though a lot of negative news is being reported, this doesn’t mean there is no good in this world. It’s our duty to search for wonderful actions by wonderful people. While the traditional media outlets focus on the news stories which attract the bulk of readers, your facebook feed is composed of information of a totally different nature. Instead of reporting on the horrible things that occurred in 2016, it contains intimate moments of your friends and acquaintances. Their goal is not to maximize advertisement profits and thus number of views, to the contrary, these updates are meant for a private audience. Consequently, updates in your facebook feed have the purpose of showing what a good time everyone is having. On social media, there is a positivity bias, where positive news triggers twice as much involvement than negative news. On the macro-level, it might seem the world is awash with negativity, whereas on the micro-level everyone is having the time of their life. To wrap it up: The world is still spinning and good things are happening every day. The next time you think your life is boring when scrolling through your facebook feed, think again. Have a wonderful 2017! Next Post: Can we reverse the moral waterfall? – G.K.